Mugg and Bean (M&B) announced the launch of their snack menu options in support of Discovery’s 10-week Vitality Open campaign. Both Discovery AS WELL AS non-Discovery members will able to redeem their Discovery Vitality Active Rewards at M&B’s Sit-Down and On-The-Move restaurants nationwide by simply downloading and registering on the Discovery App. The Vitality Open will be offering half price M&B coffee over a 10-week challenge programme for users that reach either their fitness or driving goals. Look out for M&B’s new, scrumptious snack menu options - Smashed Avo and Egg on Toast, Moroccan Butternut and Chickpea Salad and Avo and Rainbow Slaw Toast in their Sit-Down restaurants; and Fresh Berry Blaze and Caprese Sandwich in their On-The-Move outlets. For more information, download the Discovery App from either Google Play or the App Store, or simply visit M&B to see how to redeem. 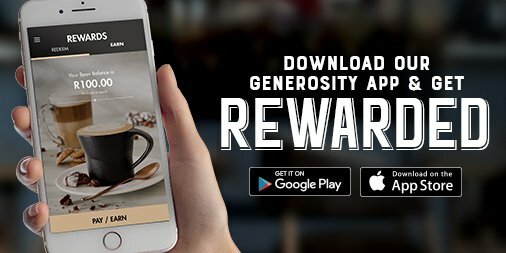 Follow us on either Facebook, Twitter or Instagram and share your pics of Active Rewards redemptions in one of our 200+ restaurants nationwide.